Since 1866, the Sanborn Map Company has mapped urban development in cities and towns throughout the US to help insurance companies underwrite fire insurance policies. Sanborn's surveyors created a series of maps for each town-- an index map showing the whole, followed by a legend to explain symbols, and individual sheets covering smaller areas, such as a few blocks. By consulting annual amendments pasted onto detailed plans drawn at a small scale (1 inch to 50 feet), individuals, municipalities and insurance companies could identify building materials, uses and footprints. Other practical details include water infrastructure that supported fire companies. Reading color and sophisticated keys, someone interested in fire risk could take in a building or a block's challenges or strengths at a glance. The first Sanborn fire insurance book for Saratoga Springs had 13 maps (1884); by 1889, the company prepared 28 sheets. The 1900 edition increased to 40 sheets, and the 1900-1950 edition over 50 sheets, emphasizing the increasingly dense use of the community's space (Library of Congress holdings). Several original volumes can be found in area collections, including those of the City Assessor's office, the Saratoga Springs Public Library, and Saratoga Springs Preservation Foundation. Today, these maps serve historians as often as business, helping reconstruct the use of a given plot of land over the last 150 years. This title page and index map comes from the 1954 Sanborn's Insurance Maps of Saratoga Springs (amended 1957). This copy, from the City Assessor's Office, contains updates pasted onto the map until at least 1976, each small piece erasing old and creating new information about the changing city. Some notable amendments indicate population growth and the construction of I-87 (Northway) whose exit (14) is located near Yaddo and the Racetrack. Although Sanborn's no longer updates the paper maps, the company maintains an archive of over 1.2 million fire insurance maps and has transitioned to the digital age offering many services, including orthophotography, 3-d modeling, LIDAR, and aerial imagery. 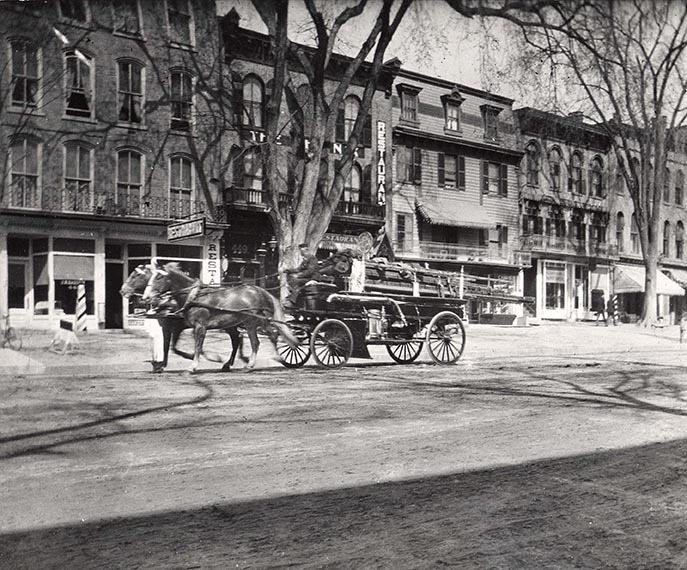 The Saratoga Springs charters -- starting in the 19th century-- took fire very seriously, identifying how the community would respond to a blaze and noting (as in the 1879 Cramer/Mott map) the location of alarm boxes to call for help. Yet even with these tools and Sanborn maps, Saratoga Springs has surrendered many homes, churches, hotels, and businesses to fire, as a list at the Saratoga Springs Public Library confirms. The 1950s was a particularly fire-prone decade, and included the most fatal fire in Saratoga Springs history. On April 12, seven members of the Abeel family and a visitor died at 35-37 Caroline Street in a devastating fire.